Imagine an internet where you couldn’t necessarily assume a web address ended in “dot com.” Imagine an internet where things were broken down by community category and you could just type in “communitycenter .gay” and find a vast listing of gay community centers. That would be kind of cool. Convenient. Intuitive, even. Kind of… in the works? 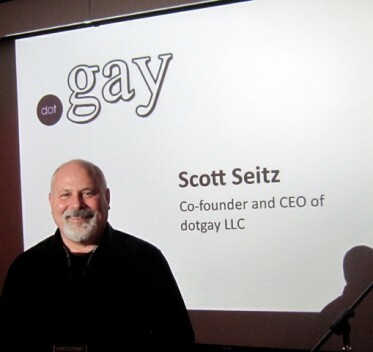 Scott Seitz, the CEO of SPI Marketing and captain of the dotgay LLC ship, is working toward making “.gay” a reality. dotgay LLC has applied for a top level domain, or TLD (like .com, .org, .biz, .edu) with ICANN, the behind-the-scenes authority on all things internet. It’s a lengthy, expensive process involving serious research, a detailed business plan, a really, really long application, and a whole lot of politics – and Seitz is in it up to his eyeballs. Seitz was brought into the race for .gay (as opposed to .lgbt, .lgbtq, or .queer) by the initiator of the venture, Alexander Schubert, and has since built up a team and taken the reigns. According to Google, “gay” has far more grab than “lgbt,” but can it genuinely encompass, say, a totally trans* focused site? Seitz says yes, and doesn’t want .gay to be divisive or exclusive to cisgender gays and lesbians. He acknowledges that the trans* community, the intersex community, the queer community and so on aren’t necessarily or inherently gay – but gay is the umbrella term used by the vast majority of google searchers and its a three-letter word, like .com, .mil, .org. From a global user standpoint, .gay wins. dotgay LLC is not alone in their quest to own the .gay TLD. Competing for this prime piece of internet real estate are several others, all of whom are applying under standard applications. A standard application for a TLD is mostly an entrepreneurial venture, an application to own the domain and sell the subdivisions within the new internet neighborhood, with no obligation to provide benefit to the community. Seitz and dotgay are taking an altogether different approach and applying with a community application which requires their commitments to the community to be put in writing. If Seitz and crew can legitimately demonstrate via their application that “gay” is a real community and their application meets ICANN’s standards, they will have an automatic win over the standard applications. Seitz sees .gay as having a major opportunity to connect the LGBTQ+ community. “We want to provide a clear benefit to members. What if we could leverage the memberships to get an unheard of price from a service company to provide better bandwidth availability for pride organizers and not-for-profits? [We] can design rules for the gay domain space that reflect our users, work proactively to lobby for our rights with internet policy groups, and with our community policy board, [we] can sculpt a set of domain rules geared to help reduce abuse from internet speculators toward all residents of the .gay cyberspace,” Seitz says. The .gay TLD could facilitate linking LGBTQ+ organizations across the globe. By creating well-monitored, intelligently designed hubs on certain reserved second level domains (like communitycenter.gay or HIV.gay) and allowing domains to link to these hubs for free or by selling low cost third level domains (nycclinic.hiv.gay, philadelphia.communitycenter.gay), Seitz can strategically link websites and communities that might otherwise not easily connect. Another aspect setting Seitz’s vision apart from the standard apps is that 67 percent of the profit from domain sales will be donated to LGBTQ+ charitable causes or not-for-profits. Some investors have recoiled from this, telling Seitz they would never put their money behind something that gives away more than two thirds of the profits. Seitz isn’t focused on the cash, though. Of course, he wants it to be a financial success and is currently looking to open it up to community investors to fund the project and maintain its feasibility, but seizing the opportunity to bring the LGBTQ+ world to the forefront of this new internet movement and connecting members of the community is more important to him than sitting on an endless goldmine. At 55, Seitz calls himself “one of the old ones” who survived the AIDS crisis that ravaged the gay male population several decades ago. “I buried 40 friends in 18 months,” he says, his otherwise jovial and exuberant voice wavering a bit. He says of the experience that if you were sick, you were only as strong as your local doctors, your clinics, and their likely limited knowledge base. Unless you were in San Francisco, New York, or LA, where there was at least some awareness of what was going on, the virus was a death sentence. This experience has been, unsurprisingly, life-changing for Seitz and has driven his desire to increase access to resources, provide funding to not-for-profits, and create more space for the LGBTQ+ community. Despite his determination, optimism, marketing prowess, and solid application to ICANN, dotgay is not going to happen without a fight. A top level domain can’t just be handed to any one group or person. Part of the approval process includes a public comment period followed by an objection period (not for the faint of heart; objections cost 15 grand to file, and it is just as much to respond). Every country has some participation in ICANN and can voice their thoughts. dotgay and .gay are currently facing opposition from several regions that have criminalized homosexuality. However, major organizations like GLAAD have signed on to support Seitz’s community-powered dotgay venture and countries with good gay rights track records are in favor as well. If it all comes to fruition and Seitz and dotgay are the winners of this hard-earned TLD, how do they keep it from turning into a mish-mash of not-so-gay sites and cyber squatters buying up domains to resell at impossibly high costs? Seitz and his team are designing a verification process and a set of rules that will make it easy to boot people out if they violate the terms of the top level domain; they are set on protecting .gay from becoming a cyber wasteland. If .gay itself is approved, we could see a major reorganization of LGBTQ+ webspace – but not for awhile. The new wave of top level domains should start appearing sometime in 2013. You can view dotgay LLC’s community application for the .gay TLD on ICANN’s website. Posted September 24th, 2012 & filed under News.